The success of the Winter Lights Festival at Canary makes it feel like an annual New Year pilgrimage already. It’s back again in 2019 for the fifth time – with recycling and climate change as a theme. So when the blues circle in January, get yourself a free blitz of illumination and technology. It’s running from January 15 to 26 and here are some of the highlights. This newly commissioned piece will allow visitors to unleash their inner child as they jump into a game of hopscotch. The chalk is replaced by a glowing outline of electric luminescent ribbon triggered by the player’s progression throughout the game. 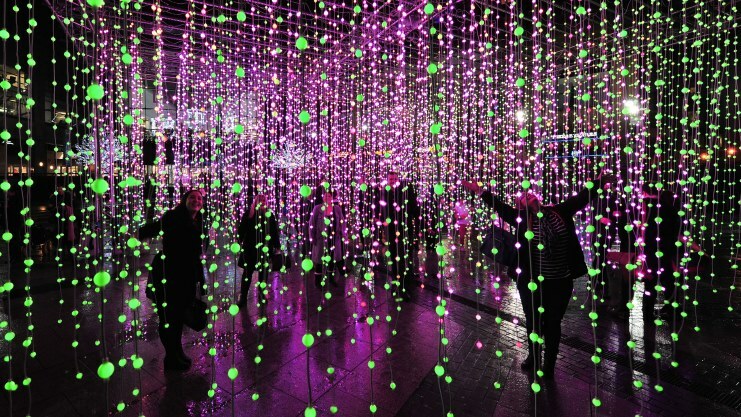 Squidsoup’s walkthrough experience will be the largest ever version of their artwork shown, made up of 24,000 individual points of suspended lights. Making its UK debut at Canary Wharf is a work from French creative studio Pitaya. This 18 metre, monumental silhouette of the whale encourages visitors to think about the effect of humans on our biodiversity. This newcomer is created by Paul & Pute and draws attention to halting pollution of the ocean with plastics – which is likely to be a theme of the year. 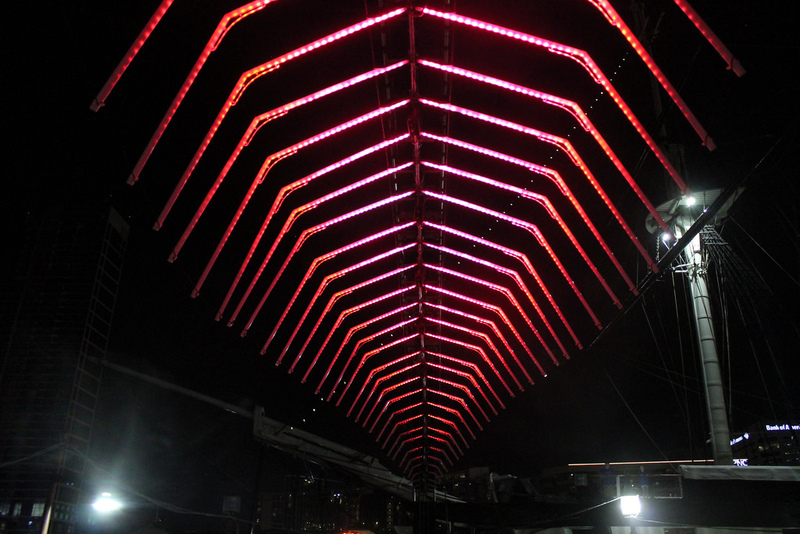 Count ’em – 50 pivoting prisms at Jubilee Plaza make up RAW Design’s Prismatica. Acting as enormous kaleidoscopes, audiences are shown displays of City life. Mürüde Mehmet’s work is made from plastic bottles by children of Tower Hamlets and painted in fluorescent colours. They highlight the waste created by plastic as the sculptures drift down streams in Jubilee Park. Art of OK’s offering evokes a deep underlying message of showing the world how to transform our waste into beautiful and useful objects. Canary Wharf Group Visual Arts curator Keith Watson said: “We wanted to capture the atmosphere of the nation moving towards a more sustainable future. Returning to Winter Lights is the perennial favourite bit.fall by Julius Popp. 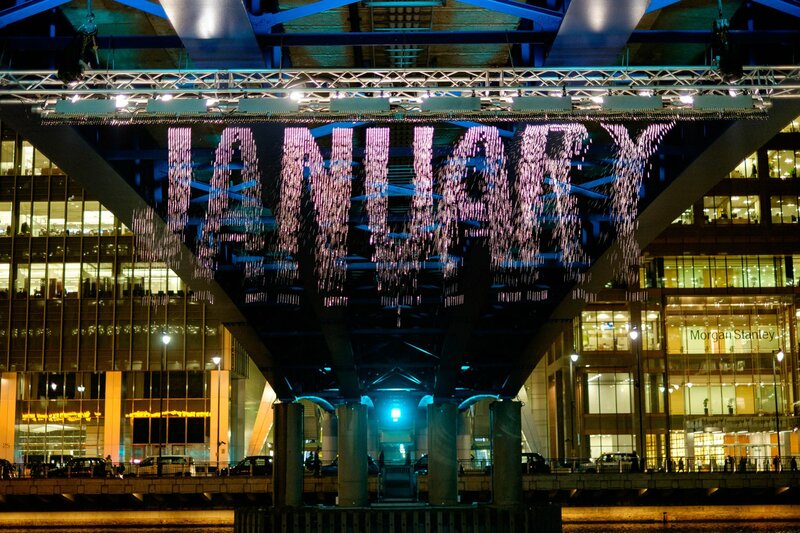 Using sophisticated water-valve technology, a series of illuminated droplets fall from the air to form words, with each sourced from the live newsfeed of The Times.